His artistic roots reach back to the Movimiento Cinético [Kinetic Movement] of the 1950s and 1960s. As his thinking on the visual arts has evolved, his ideas have changed attitudes on how color is perceived in art. According to his artist’s statement, color is an autonomous reality, devoid of anecdotes, that evolves in real time and space with no need of form or support. 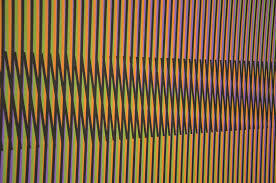 Carlos Cruz-Diez’s artistic proposal is based on eight research projects that reveal the myriad ways in which color behaves: Couleur Additive [Additive Color], Physichromie, Induction Chromatique [Chromatic Induction], Chromointerférence, Transchromie, Chromosaturation,Chromoscope, and Couleur dans l’espace [Color in Space].